The Jacksonville Jaguars have had this date circled on its calendars once the schedule was released. After losing to the New England Patriots in the AFC Championship last season, the Jaguars are no longer sneaking up on other teams this year. The stronghold for the Jaguars is undoubtedly its defense, as the likes of Jalen Ramsey and A.J. Bouye man the secondary, while the line of Calais Campbell, Malik Jackson, Yannick Ngakoue and Marcell Dareus will certainly create problems in the trenches. You also cannot forget the speedy linebacker in Myles Jack. Speaking of Ramsey, much has been made about his comments on Patriots tight end Rob Gronkowski, as the vocal corner expressed that the All-Pro struggles when being lined up against defensive backs. Gronk downplayed the comments in a press conference this week, but look for him to let his play do the talking. Another match-up to keep an eye on will be Trent Brown and Campbell. Both behemoths stand at 6-foot-8 and are over 300 lbs. Brown will be responsible for keeping Tom Brady upright and played well against Jadeveon Clowney last week in the victory against the Houston Texans. Offensively, Brady has some running back help back in the fold, as Rex Burkhead and Sony Michel are both expected to play. 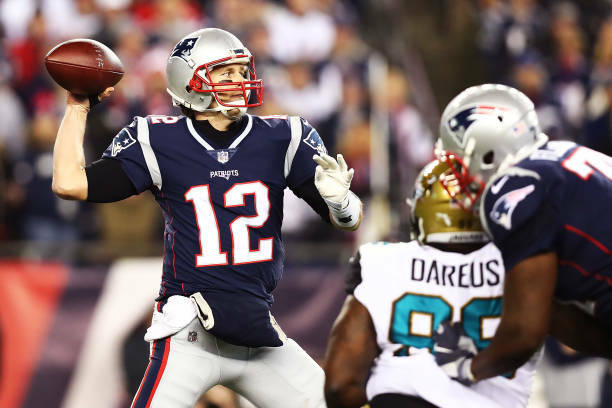 This is important because if the Jaguars’ defensive line gets penetration up front, Brady will look to the backs in the flat to move the chains. It will also be interesting to see if Brady can develop a better rapport with Chris Hogan, as the de facto No. 1 wideout only hauled in one pass for 11 yards last week. The Patriots need better production from him with Julian Edelman suspended. Defensively, the Patriots will look to continue to build off an impressive Week 1 showing against the Texans. They will get a big break, as Jacksonville running back Leonard Fournette is not expected to play with a hamstring injury. With it only being the second week of the season, Jacksonville does not want to mortgage one of its premier players on offense when it has the rest of the season to contend with. Look for the Jags to depend on TJ Yeldon to carry the load in the backfield. Meanwhile, quarterback Blake Bortles will look to Dede Westbrook and Donte Moncrief—no names that jump off the page. Stephon Gilmore did a nice job against one of the best in the league last week in DeAndre Hopkins, so look for him to continue the strong start to the season in the secondary. Bortles does have some mobility in the pocket, albeit not as much as Deshaun Watson. Look for the Patriots to have a spy on him throughout the day. With the injury to Fournette, the Patriots should be able to come away with a victory on the road. This more than likely will not be a high scoring game but look for New England to seek out a low scoring win.